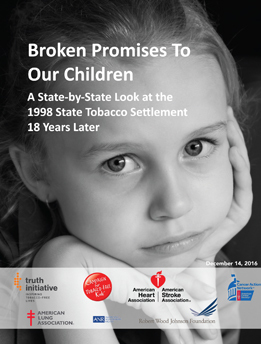 Despite receiving huge sums from the tobacco settlement and collecting billions more in tobacco taxes, the states continue to shortchange tobacco prevention and cessation programs that are proven to save lives and money. In the current budget year, Fiscal Year 2017, the states will collect $26.6 billion from the settlement and taxes. But they will spend only 1.8 percent of it – $491.6 million – on programs to prevent kids from smoking and help smokers quit. The states are spending less than two cents of every dollar collected in tobacco revenue to fight tobacco use. Meanwhile, tobacco companies spend $9.1 billion a year – more than one million dollars each hour – to market their deadly and addictive products, according to the Federal Trade Commission. This means tobacco companies spend $18 to market their products for every $1 the states spend to reduce tobacco use. This huge gap is undermining efforts to save lives and health care dollars by reducing tobacco use, the leading preventable cause of death in the United States.